This scenic 10K sports some of the most amazing view in Breckenridge. Although it is too late to participate in the race (registration is full)- it's NOT too late to kick off your Fourth of July celebration by cheering on the runners. The race end at Carter Park, just in time to catch the Main Street Parade. Pedal Faster. The race is on! The 4th of July Parade begins with lighting the fire in the annual Firecracker 50 Mountain Bike Race. Over 800 cyclists will embark on a 50 mile journey on the beautiful trails throughout the Breckenridge area. Space fills up fast, so register soon. For more information, visit, www.mavsports.com. Perhaps your style is enjoying the finer things in life as the parade goes by. 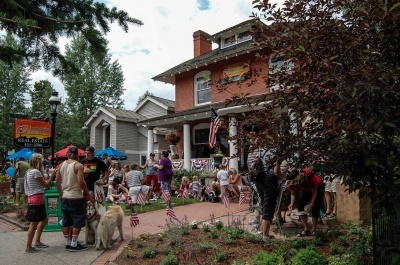 Indulge in mimosas, and breakfast spreads at the annual Breckenridge Heritage Alliance Garden Party at the Barney Ford House Museum. Call, 970.453.9767, for reservations. (There is a 24 hour cancellation policy). 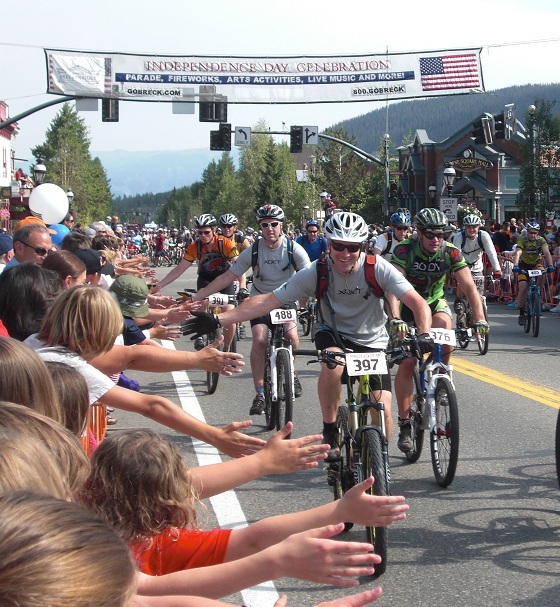 Breckenridge's official 4th of July parade will start with the Firecracker 50 Mountain Bike Race, at 9:30 a.m. The parade will start around 10 a.m., immediately following the racers. Following the parade enjoy the portrayal of George Washington reading the Declaration of Independence in the Blue River. A hit every year, enjoy an old time water fight on Main Street. Free for kids to participate. Car enthusiasts come and enjoy the current and collectible Vipers on Main Street. Rock out with the BoDeans - great live band and plenty of lawn, even when there's standing room only inside the Riverwalk. We anticipate a happy, dancing crowd! Please leave your dogs or other pets on the Riverwalk Center lawn. For more information, call the Box Office @ 970.547.3100. 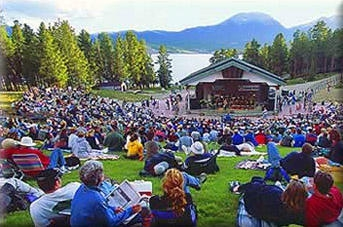 For almost 20 years, the Town of Breckenridge and National Repertory Orchestra (NRO) have coordinated together to present a Patriotic Concert. Reserved indoor seating is available with a limit of 5 tickers per person, at a cost of $5, $10 and $15, with a limit of 5 tickets per order. Tickets will be made available for sale online and in person at the Riverwalk Center Box Office located at 150 West Adams Avenue or at 970-547-3100. Doors open at 8pm. Free lawn seating, without a ticket, is available on a first come, first serve basis. Top off the day with a firework show. Always a crowd pleaser! Fireworks will be set off from the gondola lot and will be visible from most spots around town. Join in for full day of fun to celebrate our independence. Starting at noon, enjoy the kids bike parade. Surrounding the Farmers Market will be a kid's zone that will have the kids jumping for joy. Enjoy the bounce castles, giant slides and bungee jumping units.